Sales people who understand the power of persuasion are far more successful than those who lack these abilities. Persuasion is a direct result of how our brain process information and perceives value. If you don’t understand how to communicate value in a way that the brain learns and processes information you are at a serious disadvantage to the rest of the sales force. Extensive studies have been done on persuasion and the workings of the brain, we will share one of the observations here. Finding #1 There is power in Reciprocity – Reciprocate means to give in return to a previously given gift. Reciprocity in sales can start with us sharing a gift, compliment, providing a favor or special privilege to a prospect. This should be done with no strings attached. When it is something truly given, something interesting occurs in the brain. When we are given something our brains sense a need to complete a full cycle of exchange and provide something back to the giver in return. Reciprocation creates a feeling of cohesion and trust between the two parties. Reciprocity does not necessarily require the transfer of a tangible object, it can be as simple as doing the other a favor. From my own experience I have a really powerful story of how this has worked. When my wife and I bought our first home, a condominium there were complications. While I can’t remember all of the details I remember it centered around a problem with the paper work submission leading to a significant increase beyond the price originally agreed to for the purchase. (By about twenty thousand dollars – yikes!) On the phone the company we had the agreement with told us that the problem was ours and if we decided to walk away from the deal they already had another buyer anyways. We had to play their way or lose the condo altogether. My wife and I were frustrated. I decided to go down to the builder’s office to see if we could find a resolution to pay what we had originally agreed upon before the paperwork challenge. As I drove up to the building there was a man just getting out his car trying to carry a box and some golf club. I had no idea who he was but I could tell his load was a bit awkward for him. so I offered to help. I carried in the box for him and got the door. I followed him to an office in the building, put his box for him, he thanked me and I went to find the receptionists desk. When I got there I explained the reason I was there, to sort out the paper work misunderstanding. The receptionist said she had no idea who could sort this out and got on the phone. As she was on the phone the gentleman from the parking lot came to the desk and was checking for messages. He overheard the situation as she explained it on the phone. He looked at me and invited me to follow him. We went back up to the office and he heard me out. He then smiled and told me not to worry. He was the president of the company and they would honor the original deal. As I left he didn’t make any comment on the condo, instead he thanked me again for helping him with the box from his car. I know that is what got me into his office and what ultimately solved the problem. Further studies in persuasion cite that reciprocity is a power tool in persuasion. Psychologist Robert Cialdini of Arizona State University has spent his entire career studying the behavior and patterns of why we are influenced to make decisions and choices that we do. Among the six core principles of social influence he identifies reciprocity as the the top in a list of six prime principles. 1. Additional research has demonstrated that those who provide favors and privilege to their prospect have an increase in referrals, positive word of mouth and repeat business. A Real Estate friend of mine shares a wonderful gift basket for all who use her services. The result referrals and repeat business are always coming her way. Is that she performs real estate transactions better than anyone else? Probably not. But the gift given stimulates that brain of those she works with to give back to her in return. As we stated earlier the human brain is wired to complete the exchange by giving back to those who give to us. Does the value of the gift or favor make a difference? Our research would indicate it does. Often you see sales agents attempting a form of reciprocity at a coffee meeting when they spring to buy a coffee for the prospect. 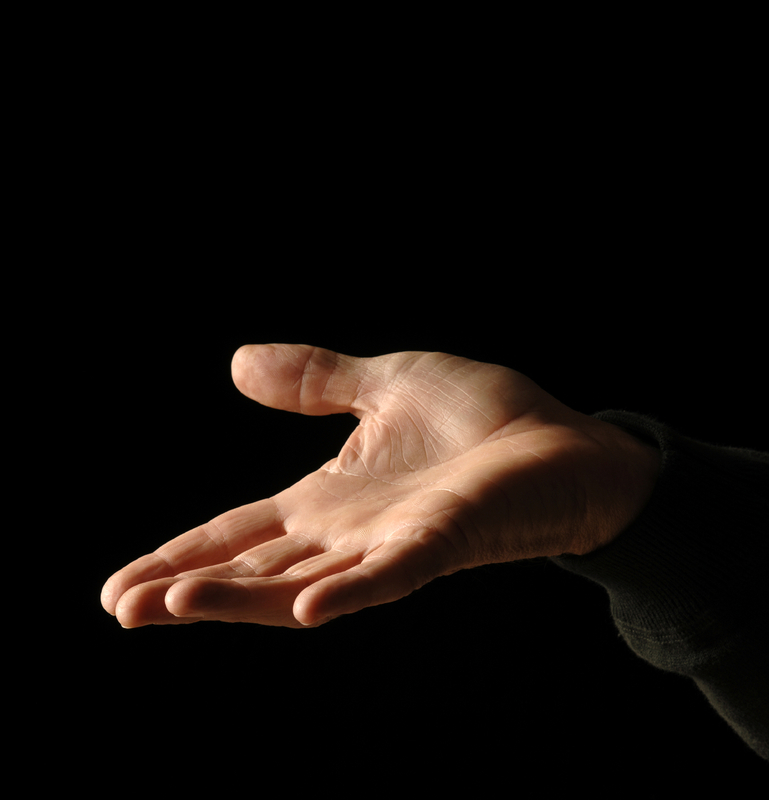 While this is a gesture of reciprocity research conducted with the Succeed Research center indicates that most prospects remain more or less unaffected by this gesture. 2. In many they even expected that the person who called the meeting or was doing the selling was kind of expected to take care of those things. The same can be said of gifts at a trade show. Pens, mugs, stickers, tattoos, balloons, calendars etc. all started out at attempts to create reciprocity, not marketing as most would suggest. The problem why they no longer work as gifts of reciprocity, and rarely work as tools of marketing, is that these gifts at this level of value given are too common and they really make very little impact on us. Reciprocity works but it cannot come across as insincere or as a cheap ploy to get us out there marketing for the company we are interacting with. It must be a true gift and something of reasonable value. Douglas Vermeeren is the director of the SUCCEED Research Center which is dedicated to sharing research on the systems that top achievers use to create lasting success. Over the last decade Vermeeren has interviewed more than 400 of the world’s top achievers, including business leaders, celebrities and professional or Olympic athletes. Douglas Vermeeren is the author of Guerrilla Achiever (With Jay Levinson) and the creator of The Opus (with Jack Canfield, Mark Victor Hansen, Dr. Joe Vitale, Dr. John Demartini, Dr. Sue Morter, Marci Shimoff, Bill Bartmann, Bob Doyle and Morris Goodman.) Currently Doug is completing another film entitled, How Thoughts Become Things. This film will explore the process of how our thoughts become manifest in our lives as reality. For more on this film go to: www.HowThoughtsBecomeThings.com For more on Douglas Vermeeren go to: www.SucceedResearch.com Douglas Vermeeren can be reached for speaking engagements and training at 1.877.393.9496. For information about the Sales Success Academy coaching and training programs please call 1.877.393.9496. My very first full time sales job was different than most. I was a commission only, door-to door pest control sales person in southern California. That’s right, I went door-to-door selling pest control services to get rid of your bugs for Terminix pest control. The product we sold was a monthly service that would come to your home each month and we combat everything from ants, cockroaches to Black widow spiders. It was from the Black Widow Spider that I learned a very interesting lesson about selling. The world's most dangerous predator? When I first began at this job I was very surprised to see just how much of a bug infestation people were willing to tolerate. I saw streams of ants rushing up a wall in one family’s kitchen. I found a plague of a thousand big dark brown roaches living inside a TV set at another house. I even found three foot long rats one time living in someones food pantry. Believe it or not those families did not believe they needed our services as they did not believe they had a ‘pest’ problem. As a result they never hired us to eliminate those problems… they may still even have them today. But there was one little fellow that always closed the deal….The Black Widow Spider. 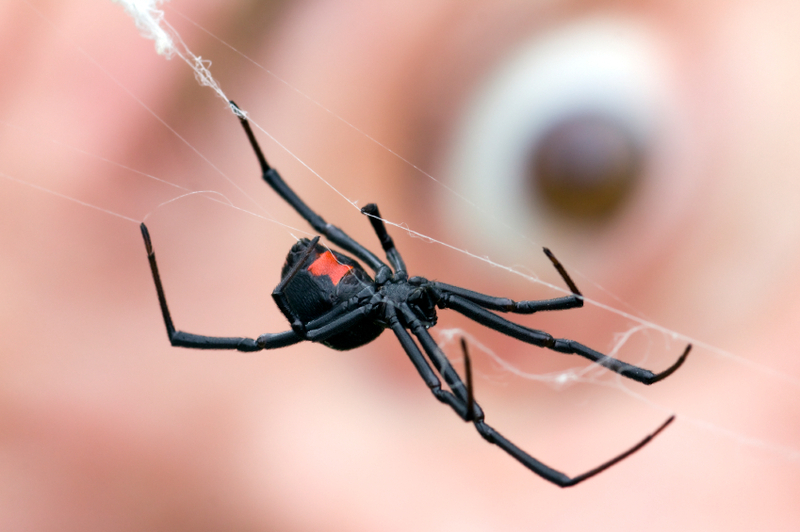 When I would encounter a home with evidence that a Black Widow spider was present the first thing I would hear from my prospect was fear and disbelief. “Where is it? Can it get to us? Are there more of them?” I would then casually point out the web and often there we would get a glimpse of one of these bold arachnids. I could see the fear grow to panic in the face of my prospect and I always noticed the nervousness in their hand as they signed a full one year contract with our company. So what was it that did it? At first I wasn’t sure. But as I summer dragged on I found a few answers from the customers directly. There was panic, fear and in one case even tears. They felt the Black Widow was the most dangerous predator to ever appear in their neighborhood. But was it? No. It all came down to the Black widows reputation. And I would have to blame the publicist for the Black Widow because it’s simply not true. While the Black Widow is somewhat dangerous, she is not the killer that everyone has painted her to be. In fact, in my whole two summers of working for this company, chatting with other inspectors and prevention technicians I had never even heard of a bite happening. And the documented cases of Black Widow bites are rarely fatal for a person in average health. But when it comes to fear logical facts don’t change a thing. In our minds the Black Widow has become synonymous with danger. Fear is a powerful emotion. And that is the key to why the Black Widow closes deals. The biggest reason we as humans buy anything is because of our emotional attachment to it. Whether it is fear, pain, pleasure, excitement or adventure. The primary reason we buy is found in the way that product makes us feel. Studies have confirmed that this emotional connection is the #1 reason we buy. We buy things all the time without any logical reason other than we appreciate the way they make us feel. In the case of the Black Widow the pest control contract brings a sense of security where there was a fear. Take a look at the history of the world’s most successful products and brands and you’ll find a pattern that they have all solved a nagging pain, a dramatic fear, a moment of embarrassment, a returning concern, a bothersome inconvenience, and even the pain of being left out. When it comes to a battle between logic and emotion, emotion will always win. George Loewenstein of Carnegie Mellon University describes this phenomenon this way, “Most of the brain is dominated by automatic process, rather than deliberate thinking. A lot of what happens in the brain is emotional, not cognitive.” 1. Think of all the consumer spending and credit card debt that is accumulated by people who know they don’t have the money – but they can’t say no. Logic always gives into emotion. And even though logic tells these people they don’t need a product they feel like they can’t live without it. Advertisers and successful sales people know that there are buttons to push within us that ignite our emotions into buying mode. Have you ever continued to buy something because of an attachment to a special memory or experience? That’s a purchasing hook. It happens all the time, you buy a specific brand of chewing gum because it happened to be the one you were chewing the night you met your first love. Or you want to wear a specific watch because that’s what James Bond wore in that movie, and you felt it was exciting. We buy because we associate that product with a specific emotion. These kind of anchoring techniques are relatively simple to master with the right kind training. ‘Emotional selling’ may create a quick purchase, but it is a very small part of the equation when it comes to creating a long term business. If the product or service does not deliver in the long term value or meet the expectations of a customer that emotional value will turn sour very quickly. Emotion is the major driving factor in our economy. If you want to be successful in sales you need to understand the most dramatic and challenging problems that your prospect has and how you solve that with your products and services. That is where the emotion is. If you can discover those needs and present solutions to them in a clear way many of the emotional hooks will take care of themselves. After all, who really wants a hunting Black Widow spider lurking nearby? To learn more about how to build these emotional hooks into your product presentations please contact us at The Sales Success Academy 1-877-393-9496. Douglas Vermeeren is a featured trainer at The Sales Success Academy. He is the director of the SUCCEED Research Center which is dedicated to sharing research on the systems that top achievers use to create lasting success. Over the last decade Vermeeren has interviewed more than 400 of the world’s top achievers, including business leaders, celebrities and professional or Olympic athletes. Douglas Vermeeren is the author of Guerrilla Achiever (With Jay Levinson) and the creator of The Opus (with Jack Canfield, Mark Victor Hansen, Dr. Joe Vitale, Dr. John Demartini, Dr. Sue Morter, Marci Shimoff, Bill Bartmann, Bob Doyle and Morris Goodman.) Currently Doug is completing another film entitled, How Thoughts Become Things. This film will explore the process of how our thoughts become manifest in our lives as reality. For more on this film go to: www.HowThoughtsBecomeThings.com For more on Douglas Vermeeren go to: www.SucceedResearch.com Douglas Vermeeren can be reached for speaking engagements and training at 1.877.393.9496. 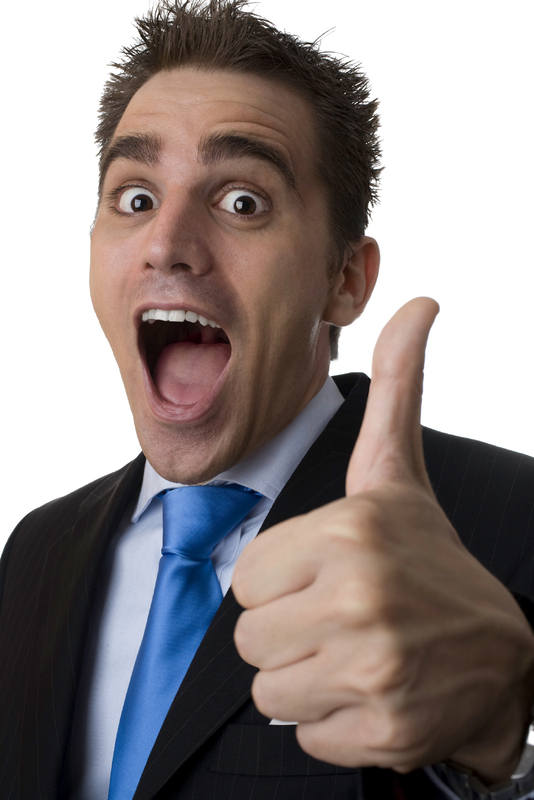 One secret that will increase your sales instantly by 65% or more! your sales instantly by 65% or more! There are many aspects of the selling cycle that a successful sales person must learn. To name a few these include lead generation, scheduling appointments, product presentation, closing the sale, delivery, follow up, asking for referrals and client management. When each of these areas can demand so much from our time it is easy to understand why we often neglect development in the one area which has the most impact. That one area that has the most impact on your bottom line has to do with creating a powerful product presentation for your client. Most sales trainers and expert sales people agree that the presentation is the most important part of the sales cycle. It is in the presentation that the customer decides to buy or not to buy. It is in your presentation that your money is made. Your presentation is about more than just creating a powerful product demo for your to see what you know. It is about creating the right presentation for your client to understand how what you offer can be valuable to them. I remember in one of my first jobs involving sales (and in almost every sales job after that too) that we had a scripted presentation.The presentation was the same for everyone we met, there were no variations. I have even had sales jobs where it was actually a requirement to memorize the presentation script down to the letter. The results were never brilliant. And even without a scripted presentation I found challenges. When I was left to create my own ‘sales pitches’ so to speak, I found that after a few dozen times my ‘pitch’ sounded more or less the same. As I met with prospective clients it seemed that about 20% of the time the script would would reasonable well and they would buy something from me. I was always excited when this happened, but I wondered what was going wrong when I presented for the other folks. It almost seemed like a roll of the dice or a numbers game. I was told by my supervisors that if I just kept at it I would eventually find the ‘right’ people that wanted to buy and I would be successful. At the time it made sense. But as I thought about it more I wondered why more people didn’t buy. Was I doing something wrong? What I had to offer was valuable. The product solved the problems that even the non-buying people had. It was affordable. What was the problem? One of the great discoveries was the theory of the 5 ways your brain learns. While it has had significant implications for my own brain, I have been astounded by the results it has had as I have interacted with others. When we understand a persons dominant learning styles and the way their brain processes information we can begin to communicate with them in a way that makes sense for them. And when something makes sense in the way the prospect needs to hear it they make a commitment to take direct action and purchase. It is that simple. Our thinking patterns are very peculiar and finicky. The brain sorts information very quickly and makes many decisions based on the way we have have trained it over time. We are each unique individuals and it is no wonder that when our presentations are generically scripted that our results are not spectacular. If information is not arriving to prospect in a way that their brain needs to hear it, that information will not be valued and in some cases may even be misunderstood. By using the strategies of the 5 ways your brain learns you can raise your positive response rates significantly and increase your bottom line in the process. Since implementing this programs for sales companies in the United States and Canada I have noticed a dramatic increase in the sales results for many companies and individuals. On average the increase was 65%. increase you would like to have in your life? Now here’s the good news, this result is not that difficult to attain. There are just a few easy lessons you need to master. For more information on how you can learn how to do this please call 1.877.393.9496 or email Rachel@douglasvermeeren.com to find out how you can gain this information today. Over the last decade Douglas Vermeeren has conducted research in to the lives of more than 400 of the world’s top achievers, including business leaders, celebrities and professional or Olympic athletes. Douglas Vermeeren is the author of Guerrilla Achiever (With Jay Levinson) and the creator of The Opus (with Jack Canfield, Mark Victor Hansen, Dr. Joe Vitale, Dr. John Demartini, Dr. Sue Morter, Marci Shimoff, Bill Bartmann, Bob Doyle and Morris Goodman.) Currently Doug is completing another film entitled, How Thoughts Become Things. This film will explore the process of how our thoughts become manifest in our lives as reality. For more on this film go to: www.HowThoughtsBecomeThings.com For more on Douglas Vermeeren go to: www.SucceedResearch.com Douglas Vermeeren can be reached for speaking engagements and training at 1.877.393.9496. Are you Pattern Primed for Success? 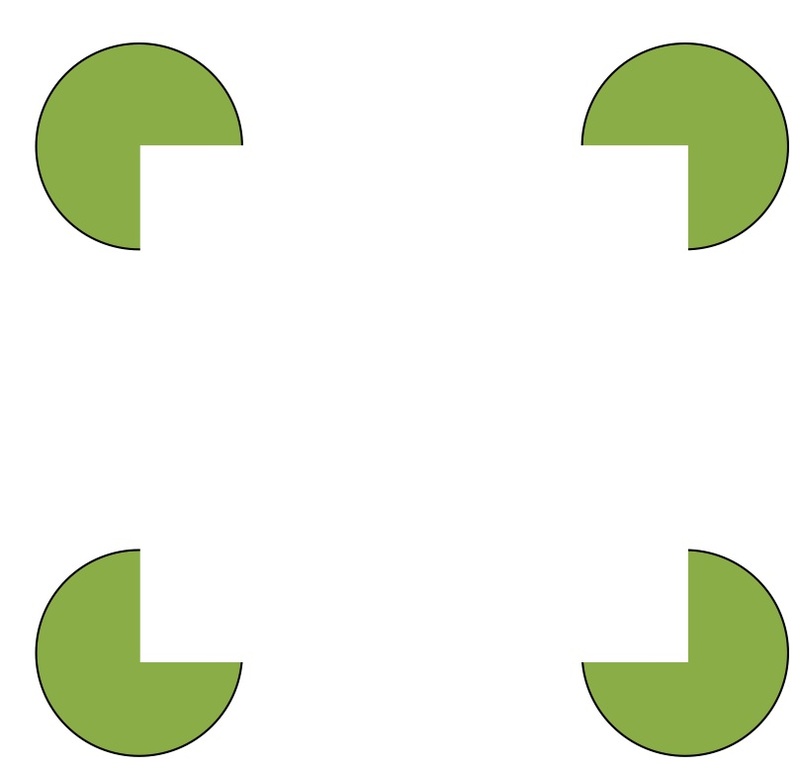 What do you see in the center of these Circles? It’s time to head back to school. As everyone starts off with a fresh view and clean slate. If you want to add a significant brain tool to how you learn this year then listen up, because we have something powerful for you. And even if you’re not a student listen up because the technique we are about to share has been scientifically proven to help in a variety of settings including work, family life and staying focused with important goals. Our brains are wired in a very unique way that strives to seek out patterns and seeks out the completion with all stimuli that it encounters. That’s one of the reasons why we sometimes have the urge to finish peoples sentences, feel the need to finish a TV show even though we may be bored with it, why kids are told to finish their dinner and why the optical illusion on this page tells your brain there is a square between the four circles when it is not there. Our brain fills in the blanks and is constantly on the look out for other patterns to complete or questions to answer. The principle of pattern priming utilizes this natural tendency of the brain. Pattern Priming is simply this. You prime your brain by creating blanks that your brain will crave to fill. Pattern priming utilizes our brains specific ability to recognize. Recognition is a powerful system our mind uses to file. Recognition is not only used to categorize new information, but also to retrieve it when using our memory. There are two kinds of memory retrieval; Recognition and basic information recall. Studies have demonstrated that our ability is far more powerful for recognition than it is for basic information recall. To illustrate participate in this experiment, If I asked you the what was the date of the Apollo 11 lunar landing on the moon are you able to recall the exact date? Now if I asked you to recognize the specific date from the following dates: August 14, 1972; December 3, 1984; July 20, 1969, are you able to pick it out of the options available to you? Which is easier? If you had been exposed to that historical date prior to this experiment you will have found that recognition of an existing answer is always easier than attempting to reproduce an answer on your own. This is also one of the reasons we are often much better at remembering the faces than the names of people we meet. Recognition a powerful system that our brain utilizes to quickly interpret a situation. And recognition is a key factor in being able to pattern prime. Let me give a personal example from my own life of how pattern priming helped me solve a problem I struggled with. I have always suffered form learning difficulties in school. Most of these challenges have had to do with attention or lack of ability to focus. While in college I struggled with my first course in general psychology. I loved the information, but I had a hard time following the readings in the text. Don’t get me wrong I enjoyed reading the information, I just could not get much of it to stay in my brain. I couldn’t anchor it because I had no context or application strategy. (We can talk about those points in another post.) Then I learned the idea of priming. My priming technique was simple. Rather than just read through the text book hoping for results, I started my study session by creating a series of questions that I thought could be on my tests. Often times I would get these from the chapter summaries in the book. I also began to ask the teacher after class more questions about what he thought was the most important points in this weeks assignment. With more than 25 questions or blanks to fill I began to read the text book. My mind was now primed not just to read but to search. When the answered appeared in the readings they were now vivid and almost popped off the page. My brain was pattern primed to seek for closure by finding the answers. From that day on I changed the way that I learned. Rather than look for answers I looked for questions. When I created unanswered patterns in my mind I found my brain holding onto the answers more firmly as I found them. Effective learning, I found was not a matter of taking more notes in class, but asking as many relevant questions as I could come up with so that may brain could get to work. The results for me were quite dramatic. My teachers and I saw an improvement from a D to B+ and then to an A in just a matter of weeks. While the above example may seem simple, pattern priming works. Whether it is to find an answer to a question in a school course, fill in the blank on a design, stay focused with goals that matter or simply to find closure on an idea, priming is a powerful tool for directing focus and getting the results you are looking for. Put your mind on a mission by priming it to seek out and zero-in on the results that you want in your life right now. Douglas Vermeeren is the director of the SUCCEED Research Center which is dedicated to sharing research on the systems that top achievers use to create lasting success. Over the last decade Vermeeren has conducted research into the cognition and behavior of more than 400 of the world’s top achievers, including business leaders, celebrities and professional or Olympic athletes. Douglas Vermeeren is the author of Guerrilla Achiever (With Jay Levinson) and the creator of The Opus (with Jack Canfield, Mark Victor Hansen, Dr. Joe Vitale, Dr. John Demartini, Dr. Sue Morter, Marci Shimoff, Bill Bartmann, Bob Doyle and Morris Goodman.) Currently Doug is completing another film entitled, How Thoughts Become Things. This film will explore the process of how our thoughts become manifest in our lives as reality. For more on this film go to: www.HowThoughtsBecomeThings.com For more on Douglas Vermeeren go to: www.SucceedResearch.com Douglas Vermeeren can be reached for speaking engagements and training at 1.877.393.9496.